The U.S. Army Aviation Center of Excellence welcomed a new capabilities manager at a change of charter ceremony held at the USAACE Headquarters July 3. Col. Michael E. Demirjian formally received the charter to lead the Training and Doctrine Command Capability Manager for Reconnaissance and Attack from outgoing director Col. Paul A. Cravey during the event. Ceremony host Col. Tom von Eschenbach, director of the Capability Development and Integration Directorate here, in his opening remarks bid farewell to the Cravey family and welcomed the Demirjians. "Mike, I'm sure you'll continue to carry the torch along with other big rocks you just inherited from Paul. As we take on the formation of the Army Futures Command, you're the right strategic leader to take on these complex tasks and our challenging future. Mike and Courtney, we're thrilled to have both of you on our team, and look forward to working with you," von Eschenbach said. 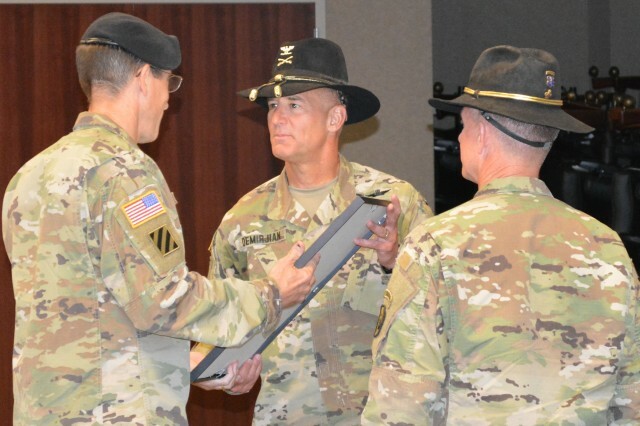 The capability manager is the best place to be as the Army faces a future where "emerging competitors challenge our place in the world," von Eschenbach said. 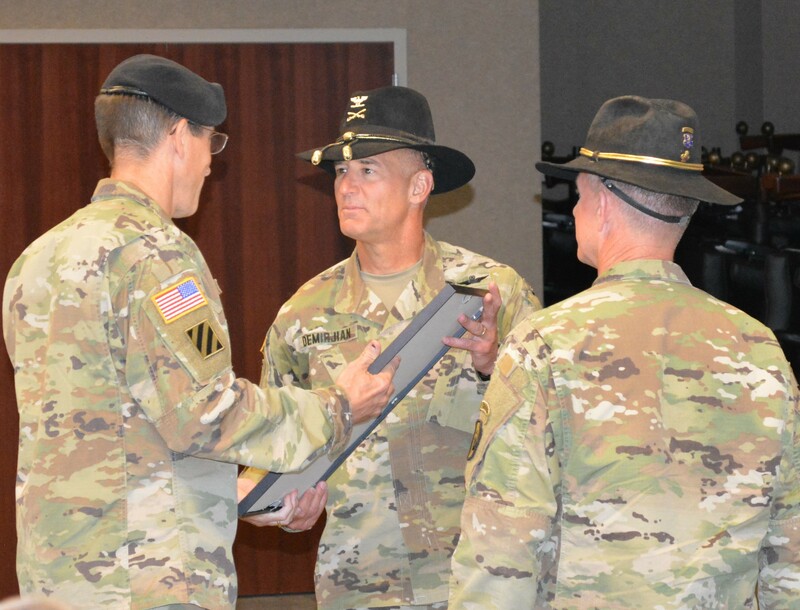 TRADOC capability managers are "the organizations that take on the problems of today and tomorrow, and drive the engine of how we design, acquire, build and improve tomorrow's Army," he said. The TRADOC Capability Manager serves as the warfighter's representative and the single point of contact for all systems assigned under the charter. The organization manages all facets of user activities, and ensures all aspects of training are synchronized with the fielding of the assigned systems. The charter, signed by the commanding general of TRADOC, empowers the TCM to serve as the combat developer and user representative for all systems assigned to them. They fight to ensure their systems surpass all expectations, and provide current and future warfighters the best combat capable equipment possible. Demirjian comes to the TCM from his most recent assignment as commander of Air Traffic Services Command and the 164th Theater Airfield Operations Group here. Demirjian thanked the audience for attending the ceremony to "celebrate the accomplishments of the TCM Recon/Attack team and celebrate Cravey's career," he said. He also thanked Maj. Gen. William K. Gayler, USAACE commanding general for the opportunity to serve as director of the TCM. "It allows me to continue to support our incredible Soldiers and warfighters. I'm looking forward to the challenges of learning a whole new language … and navigating the future of (TCM Recon/Attack) with the stand up of Army Futures Command," Demirjian said. Demirjian joined the Army in 1989 and became a warrant officer and AH-1 and OH-58 Aviator. He served as pilot in command and unit trainer at Fort Carson, Colo. and Camp Page, Korea. He was commissioned as an Aviation officer in 1994. He was assigned to Schweinfurt, Germany; Fort Polk, La. ; Washington, D.C.; Fort Irwin, Calif.; Fort Leavenworth, Kan.; Fort Bragg, N.C.; Hunter Army Airfield and Fort Stewart, Ga.
Demirjian commanded at every level from company to brigade and held a number of staff positions to include the deputy director of the Chief of Staff of the Army's Coordination Group, and also as a Joint Chiefs of Staff/Office of the Secretary of Defense intern to the Chief of Plans (G5). He completed Senior Service College at the National War College at Fort McNair, Washington, D.C.
His deployments included in support of Operation Joint Endeavor and Operation Enduring Freedom. Von Eschenbach thanked Cravey, the outgoing director, and his wife Lesley for their "commitment, long hours spent away from each other, and unmatched energy in doing an extremely important job for our nation." Under Cravey's leadership, the former TCM Unmanned Aircraft Systems organization merged with the TCM Recon/Attack. "It allowed us to build a team that focuses on enabling and advancing interoperability and lethality with the things that we have on hand until such time as we can round out the most critical capability gap in our Army," Cravey said. The mission of the TCM is not easy or inexpensive, and it doesn't come (about) quickly enough, which requires a determined attitude, according to von Eschenbach. Undaunted by the task, Cravey proved to be the "epitome of a Cavalry officer--lightly armed, undermanned, but always out front constantly in the fight for information regardless of the danger," von Eschenbach said. "Paul Cravey never let those obstacles dampen his passion nor stop him from knocking down every target to get the best kit for Soldiers directly engaged against those who threaten our national security," he said. The CDID director also thanked the employees who make their leader successful.